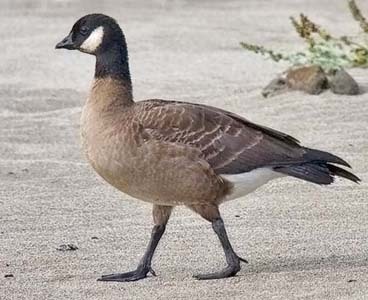 There are actually four subspecies of Cackling Goose, but one (Hutchinson's Cackling B. h. hutchinsii) breeds in high eastern Canada and has not yet occurred in California. Only two (Ridgway's & Aleutian) have been documented in Monterey County. To distinguish between these population, we need to consider size, head shape, and bill size & shape, plus four additional features. One of those is upperpart pattern, and particularly the pattern on the upperwing coverts. In Jeff Poklen's fine shot (above) note how much darker and patterned the upperwing coverts of Ridgway's Cackling Goose are compared to a large Canada Goose. The decidedly patterned greater coverts are an important feature of Ridgway's Cackling. 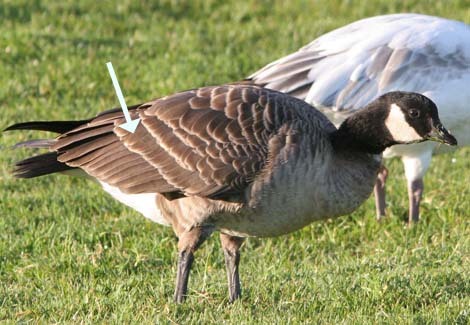 Each feather of those coverts has a rather dusky base, then a much darker subterminal band, and finally a contrastingly pale tip (below left; arrow points to the greater coverts). Aleutian Cackling (below right) has a dusky base to each feather and a pale tip, but typically lacks the subterminal dark band of Ridgway's. 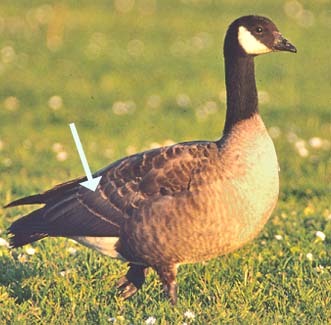 Another character is whether or not the goose has a gular stripe — a dark stripe from throat to chin that separates the two white cheeks from each other. 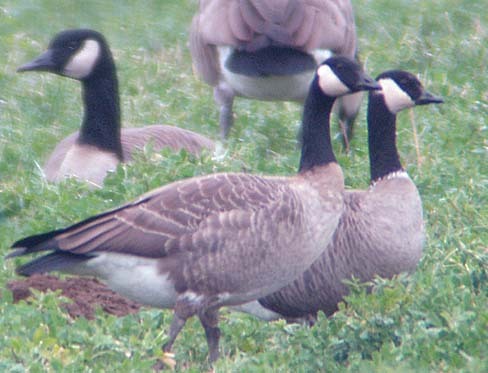 This Aleutian Cackling (right) shows a broad dark gular stripe; indeed, most Aleutian Geese have gular stripes while most of the other geese under review here do not. As a generality, the smaller and darker populations of Canada (e.g., occidentalis) and Cackling have a tendency towards a gular stripe, while very few large or pale populations (e.g., moffitti) show it, but like most other things, these are tendencies and not absolutes. Another of these tendencies — but not a diagnostic feature — is the presence or absence of a white neck ring at the base of the black neck. Most Aleutians have this ring while most Ridgway's lack it, but there are Aleutians without neck rings and Ridgway's with them. In fact, all races of Canada and Cackling may occasionally have a neck ring (B.E. Deuel, pers. comm.). Yet while a neck ring is not a diagnostic feature, standing alone, it is a very useful character in looking through flocks of geese. If a large percentage of small Cackling Geese have neck rings, it is likely they are Aleutian Cackling Geese (above; 28 Oct 2006 Carmel R. mouth). Of the three we can see, two have broad neck rings and one (on the right) has a small partial ring. The bill is short and small, but not tiny and triangular (like Ridgway's); the coverts are dusky with a pale tip, but without the better-defined subterminal band of Ridgway's; and the forehead is steep while the crown is more flat (at least on the ones to the left). This is a photo from October. Look at the goose second from left: we cannot see its head. Its coverts are not nearly as patterned as all the others we can see — this is because it is a juvenal goose that still retain its less-patterned juvenal coverts. These will be mostly replaced by winter (Pyle 2008). We can also see the gular stripe well on one bird, and it is present on all. So this is a flock of Aleutian Cacklers. It seems also reasonably true that only Aleutian Geese have very broad white collars among small cacklers (below; 3 May 2008 El Estero). The coverts are ambiguous on this goose (the median coverts look well-patterned, more like minima) but the bill is too long for minima, the crown is vaguely flattish, the breast is not purplish-dark, and the bird has a gular stripe. But it is possible that a huge broad white collar like this is outside the range of Ridgway's. 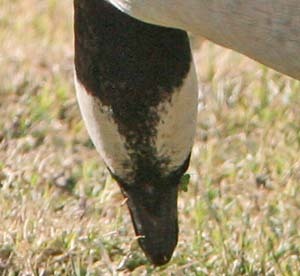 In contrast, Ridgway's Cackling Goose (below two birds) typically does not have a neck ring. They have very short, almost triangular-shaped bills, tend to have a rounded head (but not always, see below left), tend to have the darkest and most patterned upperwing coverts, and tend to lack the gular stripe (the one below left lacks a stripe, but the one below right has one). The strong majority have very dark, almost purplish-dark, breasts. They are just really dark geese. These are also tiny geese — the size of Ross's Geese — and they have really short necks. This gives us a suite of characters to consider, and we should de-emphasize neck rings and head shape, using those features only among a group of other features. There is yet another problem with which we have not yet had to deal in Monterey County, but is a problem in California's Central Valley. 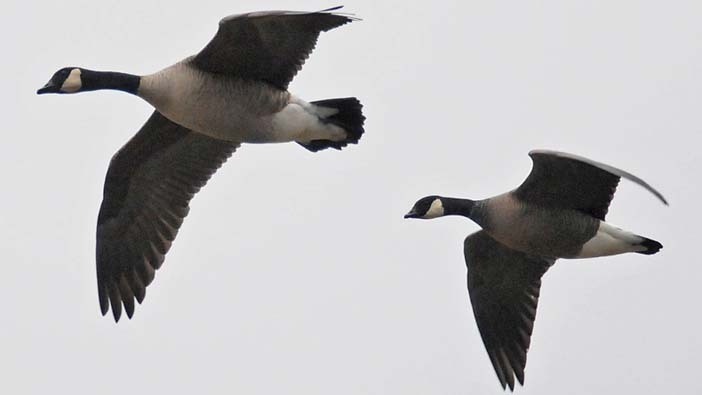 How does one separate the largest subspecies of Cackling Goose — Taverner's Cackling B. h. taverneri (below left) — from the smallest subspecies of Canada Goose —Lesser Canada Goose B. c. parvipes (below: background in left photo, individual bird on right). Both Taverner's Cackling (above left; photo Dec 2008 in Washington state © S.G. Mlodinow ) and Lesser Canada (above right; photo Anchorage © S.J. 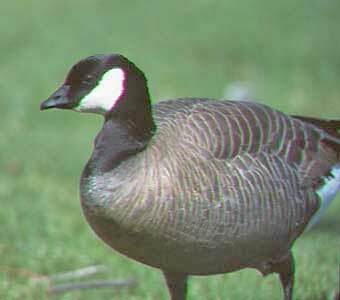 Peterson) are mid-sized geese, and both have much variation between light and darker birds. The Lesser Canada that I photographed in MTY (previous page) was a very pale bird, while those that breed near Anchorage, Alaska (above right) are much darker. Remember that these are small compared to our resident Canadas, but these are slightly larger than Aleutian Cacklers. There is a parvipes Lesser Canada in the background of the two Taverner's Cackling, showing that it is slightly bigger than Taverner's, and decidedly longer-billed. Indeed, it seems to be bill shape that is most important. The bill of Taverner's is almost triangular — but a much bigger triangle than the tiny bill of minima Ridgway's! The flight shot below — from Nisqually NWR, Washington © S.G. Mlodinow — shows a Taverner's (left) in flight next to a Ridgway's. 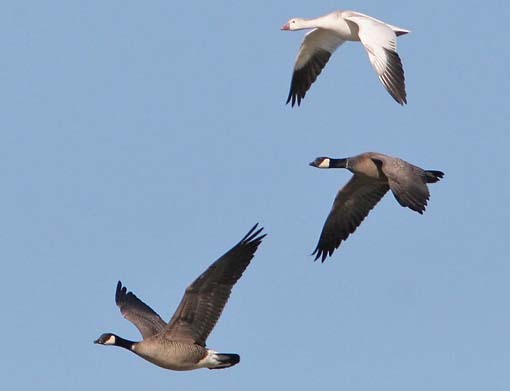 This shows the extremes in size of Cackling Geese; note again bill shape, comparative neck length, and the very dark breast (and belly) of Ridgway's Cackling. Finally, I want to re-emphasize the degree of variation in all these geese. Take our local breeding resident population: here is a mated pair on Pt. Pinos. Yet there is variation is size, neck length, and breast color. The bird on the left has a darker breast. Note also that this left-hand bird has a gular stripe, while the one on the right is more typical to lack one. Acknowledgements: I was extremely lucky that the very useful article by Mlodinow et al. (2008) arrived on my doorstep just after seeing the mystery geese in MTY! Then, Steven Mlodinow and Bruce Deuel were very helpful in working out the i.d. of Monterey geese, and contributed many useful details (and Steve sent photos!). Stacy Jon Peterson, Stuart MacKay, Jeff Poklen, and Bill Hill all graciously added photos [their websites are linked at their names]. Many thanks to all. Photos: All photos © Don Roberson, except as otherwise indicated; all rights reserved. Johnson, D.H., D.E. Timm, and P.F. Springer. 1979. Morphological characteristics of Canada Geese in the Pacific Flyway, in Management & Biology of Pacific Flyway Geese (R.I. Jarvis & J.C. Bartonek, eds). Oregon State Univ., Corvallis, OR. Mlodinow, S.G., P.F. Springer, B. Deuel, L.S. Semo, T. Leukering, T. Doug Schonewald, W. Tweit, and J.H. Barry. 2008. 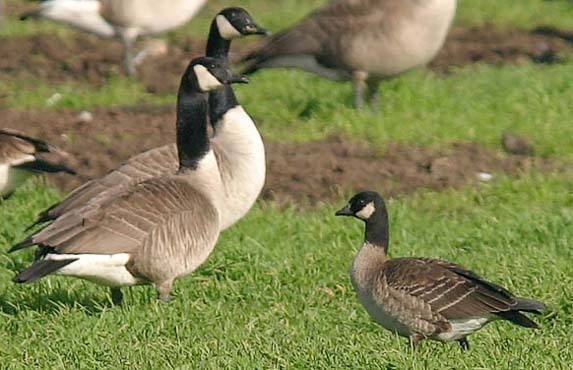 Distribution and identification of Cackling Goose (Branta hutchinsii) subspecies. North Amer. Birds 62: 344–360. Mowbray, T.B., C.R. Ely, J.S. Sedinger, and R.E. Trost. 2002. 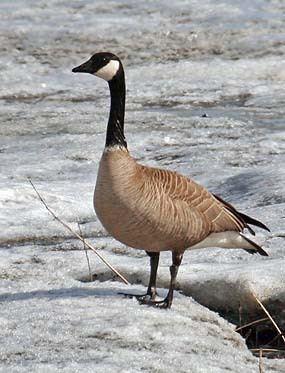 "Canada Goose" in Birds of North America, No. 682 (A. Poole & F. Gill, eds.). The Birds of North America, Inc., Philadelphia, PA.
Pyle, P. 2008. Identification Guide to North American Birds. Part II. Slate Creek Press, Bolinas. Roberson, D. 2002. Monterey Birds. 2d ed. Monterey Pen. Audubon Soc., Carmel CA.